As the weekend drew to a close in Europe and the Middle East, results of the Greek and Egyptian elections were becoming known. Both countries have seen a revival in progressive struggle and mass action on the streets over the last few years, and yet in both elections conservative forces appear to be the victors. At least for now. The contested nature of politics in both countries make the purportedly ‘tenuous’ nature of Gillard’s minority government (likely to be thrown overboard at the next election, with concrete shoes attached) seem sturdy by comparison. In Greece, New Democracy (a centre-right party committed to forcing through EU-mandated austerity) has narrowly defeated the radical SYRIZA – in a system where whomever polls the most gains an extra 50 seats in the parliament to help it form government. Yet despite their ‘win’ under this system, things are far from clear as coalitions must be negotiated between parties whose members and voters are polarised on questions of how to deal with the economic crisis and who should bear the brunt of hardship. We congratulate the Greek people on conducting their election in this difficult time. We hope this election will lead quickly to the formation of a new government that can make timely progress on the economic challenges facing the Greek people. As president Obama and other world leaders have said, we believe that it is in all our interests for Greece to remain in the euro area while respecting its commitment to reform. The 53 percent of voters who voted for anti-austerity parties might yet have something to say about that, however. In Egypt, the movement that overthrew Mubarak faces challenges. ‘Free’ elections have occurred, but the Supreme Council of the Armed Forces has issued an interim constitution, placing most political power in their hands regardless of who is elected president. The Constitutional Court has effectively shut down the parliament. 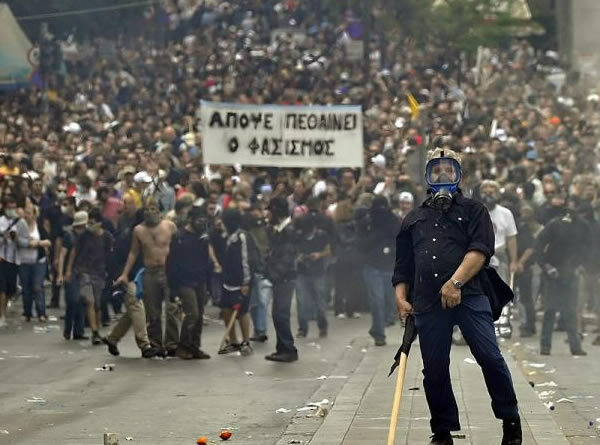 As with the results in Greece, while much focus in the mainstream media is on what is happening at the top of society, there is ongoing dissent and action from below that means each move is contested and fought. Protests in Egypt continue as ordinary Egyptians continue to strive to bring a real democracy into being. Hossam el-Hamalawy notes that while many are mourning the end of the revolution in the wake of the ‘soft coup’ of recent days, the picture is far more complex and uncertain. He notes that a soft coup was really in effect from the toppling of Mubarak, and that any idea of real democracy having since been implemented is farcical. On the other hand, he rightly points out that ‘no revolution gets settled in 18 days or 18 months’ and that the path is less than certain. While there are difficulties for revolutionaries, who lack a clear national leadership that could cohere progressive political forces, struggle and repression are never linear. In the months and years ahead there will be steps forward and back as the deep political, social and economic crisis in Egypt grows. Yesterday I woke at about 3am and immediately checked Twitter and Facebook for how the Greek election was unfolding, only to read the following simple statement from a Beirut-based friend on Egypt: ‘A parliament with no MPs, and a president with no powers’. I felt nauseous. For over four months, a friend I met via social media – and have been collaborating with on some political writing – has been caught up in the midst of these political struggles in an extraordinary way. On 11 February 2012, independent Australian journalist Austin Mackell, and his long-time Egyptian translator Ailya Alwi, were arrested as they arrived in Mahalla al-Kubra, Egypt. Austin was there to interview respected, veteran labour organiser Kamal Elfayoumi, for an article for a special issue of the academic journal Interface on the Arab Spring. I helped establish the journal, which analyses social movements, a number of years ago and am the editor for Oceania and South East Asia. The arrest of Austin, Aliya and a postgraduate student they were traveling with, Derek Ludovici, saw all three charged with inciting people to vandalise public property and government buildings. Specifically it was alleged they promised children money if they threw rocks at the Qism El-Tani police station in Mahalla. They have been advised that if convicted they face imprisonment for 5–7 years. Despite a political campaign by friends and supporters and the usual diplomatic efforts, the charges have not been dropped. However, the charges have not been ‘acted on’ either, and this has left the three in limbo. With a travel ban in place, Austin is unable to leave the country. He has been painted as a foreign spy in the state media, as part of an ongoing campaign to discredit local activists in Mahalla by associating them with fictitious foreign agendas (eg that journalists and writers are foreign spies or agitators), in order to limit the access of local people to the international media. Despite a successful motion moved by Senator Lee Rhiannon and passed in the Australian Senate, the Foreign Minister Bob Carr has failed to speak publicly on the matter, which means nothing has changed for the three. Carr has communicated platitudes about ensuring Austin receive ‘due legal process’. But this is not a situation of Austin having broken any law and justice needing to take its course. These charges are a fabrication brought against him and his colleagues that serve political ends for the Egyptian Supreme Council of Armed Forces. International and Egyptian writers, journalists and academics have been essential in bringing to light some of the worst abuses of the former Egyptian dictatorship under Hosni Mubarak, as well as abuses occurring under the current Supreme Council. The charges against Austin, Aliya and Derek are an example of the harassment and intimidation of international journalists in Egypt, who seek to expose the repression of the political movements there. You can read Austin’s article discussing his arrest and the situation in Egypt in Interface, as well as Austin’s earlier interview with Kamal Elfayoumi. If you would like to sign the open letter in support of Austin, you can do that at change.org. Bob Carr couldn’t find a microphone fast enough to brag that maybe, there just might be a chance if certain conditions are met that maybe, Mrs. Taylor could be released, sometime. The U.$. will not allow a democracy in Egypt. That damned canal is just too damn important. Sending people back to the polls for not electing the right government, is sticking your fingers up at democracy. The fraudulence of Egypt’s imposed democracy is also symbolised by the trial and conviction of Mubarak, the lone individual responsible for crimes against the Egyptian people. Meanwhile, Mubarak’s former ministers run for presidency and SCAF runs the country. That may be the kind of democracy that typically appeases watching governments, but how long can Australia pretend that’s democracy-in-action when Australian citizens can’t leave the country? Thanks for the update on Mackell’s case.